I have been dabbling for years but never doing much about it, never had the confidence as I always figured that without a “degree in art” I was not entitled to put my art forward – crazy I know. Then I decided to get more confidence so I googled “workshops in Toowoomba” and up popped Marks name. I fell in love with the way he painted water, and perspective underwater was an exercise we did in the workshop at Oakey earlier this year. When I got home I painted out all the exercise canvasses and using the notes, memory and photographs of underwater, came up with this painting. 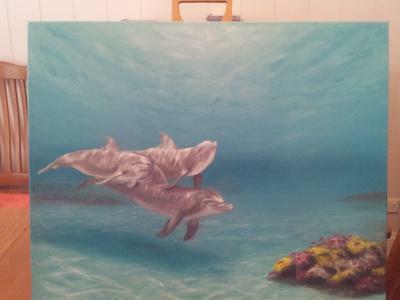 I have just added the dolphins and changed the water line. I am happy with it, the more I look at it I will pick up areas I would like to change, and the more I paint water I hope I will improve. This is such a professional-looking work! You should be very proud. I only wish I was as talented! I love this painting!!! You are so very talented! Deb, you've really nailed this! Excellent work, love your refractions and how you've captured the light.